A product designed specifically for micro SMEs with the same cover available under Management Liability with reduced sub-limits, pricing and deductibles. 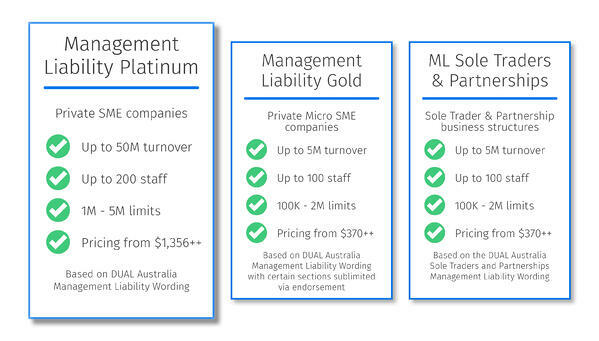 Management Liability Platinum is DUAL's original Management Liability offering and is designed for SME clients with up to $50,000,000 turnover and 200 staff. When DUAL entered the market less than 1% of Pty Ltd companies purchased this cover. After 10 years in the market, take up is now estimated to be 15%. Since launching on the WebRater in 2010, brokers have generated over 100,000 New Business indications and bound 15,000 Management Liability policies, highlighting the benefits of DUALs market leading coverage. Limits between $1,000,000 and $5,000,000 are available with pricing starting from $1,028 plus charges. If you would like further information on this offering, please contact your local DUAL Underwriter. Get a quote in under 2 minutes on the WebRater! Established in 2004, DUAL Australia Pty Ltd is a specialist underwriting agency focused on providing innovative insurance solutions to the mid-market.